This article is about the Irish writer. For the Scott Bakula character, see Sam Beckett. Samuel Barclay Beckett (13 April 1906 – 22 December 1989) was an Irish avant-garde writer, dramatist and poet, writing in English and French. Beckett's work offers a bleak outlook on human culture and both formally and philosophically became increasingly minimalist in his later career. As a student, assistant, and friend of James Joyce, Beckett is considered one of the last modernists; as an inspiration to many later writers, he is sometimes considered one of the first postmodernists. He is also considered one of the key writers in what Martin Esslin called "Theatre of the Absurd". As such, he is widely regarded as one of the most influential writers of the 20th century. Beckett was awarded the Nobel Prize in Literature in 1969 for his "writing, which—in new forms for the novel and drama—in the destitution of modern man acquires its elevation". Beckett was elected Saoi of Aosdána in 1984. The Beckett family (originally Becquet) were rumoured to be of Huguenot stock and to have moved to Ireland from France after the revocation of the Edict of Nantes of 1598, though this theory has been criticised as unlikely. The Becketts were members of the Church of Ireland. The family home, Cooldrinagh in the Dublin suburb of Foxrock, was a large house and garden complete with tennis court built in 1903 by Samuel's father William. The house and garden, together with the surrounding countryside where he often went walking with his father, the nearby Leopardstown Racecourse, the Foxrock railway station and Harcourt Street station at the city terminus of the line, all feature in his prose and plays. Beckett's father was a quantity surveyor and his mother a nurse. Samuel Beckett depicted on an Irish commemorative coin celebrating the 100th Anniversary of his birth. Beckett studied French, Italian, and English at Trinity College, Dublin from 1923 to 1927. While at Trinity, one of his tutors was the eminent Berkeley scholar and Berkelian Dr. A. A. Luce. Beckett graduated with a B.A., and—after teaching briefly at Campbell College in Belfast—took up the post of lecteur d'anglais in the École Normale Supérieure in Paris. While there, he was introduced to renowned Irish author James Joyce by Thomas MacGreevy, a poet and close confidant of Beckett who also worked there. This meeting was soon to have a profound effect on the young man, and Beckett assisted Joyce in various ways, most particularly by helping him research the book that would eventually become Finnegans Wake. In 1929, Beckett published his first work, a critical essay entitled "Dante...Bruno. Vico..Joyce". The essay defends Joyce's work and method, chiefly from allegations of wanton obscurity and dimness, and was Beckett's contribution to Our Exagmination Round His Factification for Incamination of Work in Progress, a book of essays on Joyce which also included contributions by Eugene Jolas, Robert McAlmon, and William Carlos Williams, among others. Beckett's close relationship with Joyce and his family, however, cooled when he rejected the advances of Joyce's daughter Lucia owing to her progressing schizophrenia. It was also during this period that Beckett's first short story, "Assumption", was published in Jolas's periodical transition. The next year he won a small literary prize with his hastily composed poem "Whoroscope", which draws from a biography of René Descartes that Beckett happened to be reading when he was encouraged to submit. In 1930, Beckett returned to Trinity College as a lecturer. He soon became disillusioned with his chosen academic vocation, however. He expressed his aversion by playing a trick on the Modern Language Society of Dublin, reading a learned paper in French on a Toulouse author named Jean du Chas, founder of a movement called Concentrism; Chas and Concentrism, however, were pure fiction, having been invented by Beckett to mock pedantry. After leaving Trinity, Beckett began to travel in Europe. He also spent some time in London, where in 1931 he published Proust, his critical study of French author Marcel Proust. Two years later, in the wake of his father's death, he began two years' treatment with Tavistock Clinic psychoanalyst, Dr. Wilfred Bion, who took him to hear Carl Jung's third Tavistock lecture, an event which Beckett would still recall many years later. The lecture focused on the subject of the "never properly born," and aspects of it would become evident in Beckett's later works including Watt and Waiting for Godot. In 1932, he wrote his first novel, Dream of Fair to Middling Women, but after many rejections from publishers decided to abandon it; the book would eventually be published in 1993. Despite his inability to get it published, however, the novel did serve as a source for many of Beckett's early poems, as well as for his first full-length book, the 1933 short-story collection More Pricks Than Kicks. Beckett also published a number of essays and reviews around the time, including "Recent Irish Poetry" (in The Bookman, August 1934) and "Humanistic Quietism", a review of his friend Thomas MacGreevy's Poems (in The Dublin Magazine, July–September 1934). These two reviews focused on the work of MacGreevy, Brian Coffey, Denis Devlin and Blanaid Salkeld, despite their slender achievements at the time, comparing them favourably with their Celtic Revival contemporaries and invoking Ezra Pound, T. S. Eliot and the French symbolists as their precursors. In describing these poets as forming 'the nucleus of a living poetic in Ireland', Beckett was tracing the outlines of an Irish poetic modernist canon. In 1935 — the year that Beckett successfully published a book of his poetry, Echo's Bones and Other Precipitates —, he was also working on his novel Murphy. In May of that year, he wrote to MacGreevy that he had been reading about film and wished to go to Moscow to study with Sergei Eisenstein at the Gerasimov Institute of Cinematography in Moscow. In mid-1936, he wrote to Sergei Eisenstein and Vsevolod Pudovkin, offering to become their apprentices. Nothing came of this, however, as Beckett's letter was lost owing to Eisenstein's quarantine during the smallpox outbreak, as well as his focus on a script re-write of his postponed film production. Beckett, meanwhile, finished Murphy, and then, in 1936, departed for extensive travel around Germany, during which time he filled several notebooks with lists of noteworthy artwork that he had seen, also noting his distaste for the Nazi savagery which was then overtaking the country. Returning to Ireland briefly in 1937, he oversaw the publishing of Murphy (1938), which he himself translated into French the next year. He also had a falling-out with his mother, which contributed to his decision to settle permanently in Paris (where he would return for good following the outbreak of World War II in 1939, preferring — in his own words — "France at war to Ireland at peace"). His was soon a known face in and around Left Bank cafés, where he strengthened his allegiance with Joyce and forged new ones with artists like Alberto Giacometti and Marcel Duchamp, with whom he regularly played chess. Sometime around December 1937, Beckett had a brief affair with Peggy Guggenheim, who nicknamed him "Oblomov" after the titular figure in Ivan Goncharov's novel. 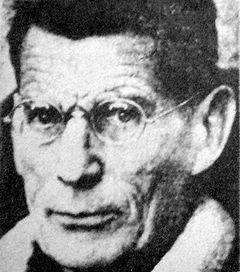 In Paris, in January 1938, while refusing the solicitations of a notorious pimp who ironically went by the name of Prudent, Beckett was stabbed in the chest and nearly killed. James Joyce arranged a private room for the injured Beckett at the hospital. The publicity surrounding the stabbing attracted the attention of Suzanne Dechevaux-Dumesnil, who knew Beckett slightly from his first stay in Paris; this time, however, the two would begin a lifelong companionship. At a preliminary hearing, Beckett asked his attacker for the motive behind the stabbing, and Prudent casually replied, "Je ne sais pas, Monsieur. Je m'excuse" ("I do not know, sir. I'm sorry"). Beckett occasionally recounted the incident in jest, and eventually dropped the charges against his attacker—partially to avoid further formalities, but also because he found Prudent to be personally likeable and well-mannered. Beckett joined the French Resistance after the 1940 occupation by Germany, working as a courier, and on several occasions over the next two years was nearly caught by the Gestapo. In August 1942, his unit was betrayed and he and Suzanne fled south on foot to the safety of the small village of Roussillon, in the Vaucluse département in the Provence Alpes Cote d'Azur region. Here he continued to assist the Resistance by storing armaments in the back yard of his home. During the two years that Beckett stayed in Roussillon he indirectly helped the Maquis sabotage the German army in the Vaucluse mountains, though he rarely spoke about his wartime work. Beckett was awarded the Croix de guerre and the Médaille de la Résistance by the French government for his efforts in fighting the German occupation; to the end of his life, however, Beckett would refer to his work with the French Resistance as 'boy scout stuff'. He continued work on the novel Watt (begun in 1941 and completed in 1945, but not published until 1953, though an extract had appeared in the Dublin literary periodical Envoy) while in hiding in Roussillon. In 1945, Beckett returned to Dublin for a brief visit. During his stay, he had a revelation in his mother’s room in which his entire future literary direction appeared to him. This experience was later fictionalized in the 1958 play Krapp's Last Tape. In the play, Krapp’s revelation, perhaps set on the East Pier in Dún Laoghaire (though nothing in the play would substantiate this presumption) during a stormy night, and some critics have identified Beckett with Krapp to the point of presuming Beckett's own artistic epiphany was at the same location, in the same weather. However, most literary critics would caution against equating a character's experiences with those of their authors. Throughout the play, Krapp is listening to a tape he made earlier in his life; at one point he hears his younger self saying this: “...clear to me at last that the dark I have always struggled to keep under is in reality my most...” Krapp fast-forwards the tape before the audience can hear the complete revelation. Beckett later revealed to James Knowlson (which Knowlson relates in the biography Damned to Fame) that the missing words on the tape are "precious ally". Beckett claimed he was faced with the possibility of being eternally in the shadow of Joyce, certain to never best him at his own game. Then he had a revelation, as Knowlson says, which “has rightly been regarded as a pivotal moment in his entire career." Knowlson goes on to explain the revelation as told to him by Beckett himself: "In speaking of his own revelation, Beckett tended to focus on the recognition of his own stupidity ... and on his concern with impotence and ignorance. He reformulated this for me, while attempting to define his debt to James Joyce: 'I realized that Joyce had gone as far as one could in the direction of knowing more, [being] in control of one’s material. He was always adding to it; you only have to look at his proofs to see that. I realized that my own way was in impoverishment, in lack of knowledge and in taking away, in subtracting rather than in adding.'" Knowlson explains: "Beckett was rejecting the Joycean principle that knowing more was a way of creatively understanding the world and controlling it ... In future, his work would focus on poverty, failure, exile and loss -- as he put it, on man as a 'non-knower' and as a 'non-can-er.'" Beckett is publicly most famous for the play Waiting for Godot. In a much-quoted article, the critic Vivian Mercier wrote that Beckett "has achieved a theoretical impossibility—a play in which nothing happens, that yet keeps audiences glued to their seats. What's more, since the second act is a subtly different reprise of the first, he has written a play in which nothing happens, twice." (Irish Times, 18 February 1956, p. 6.) Like most of his works after 1947, the play was first written in French with the title En attendant Godot. Beckett worked on the play between October 1948 and January 1949. He published it in 1952, and premiered it in 1953. The English translation appeared two years later. The play was a critical, popular, and controversial success in Paris. It opened in London in 1955 to mainly negative reviews, but the tide turned with positive reactions by Harold Hobson in The Sunday Times and, later, Kenneth Tynan. In the United States, it flopped in Miami, and had a qualified success in New York City. After this, the play became extremely popular, with highly successful performances in the U.S. and Germany. It is still frequently performed today. Beckett was now writing mainly in French. He translated all of his works into English himself, with the exception of Molloy, whose translation was collaborative with Patrick Bowles. The success of Waiting for Godot opened up a career in theatre for its author. Beckett went on to write a number of successful full-length plays, including 1957's Endgame, the aforementioned Krapp's Last Tape (written in English), 1960's Happy Days (also written in English), and 1963's Play. In 1961, in recognition for his work, Beckett received the International Publishers' Formentor Prize, which he shared that year with Jorge Luis Borges. The 1960s were a period of change, both on a personal level and as a writer. In 1961, in a secret civil ceremony in England, he married Suzanne, mainly for reasons relating to French inheritance law. The success of his plays led to invitations to attend rehearsals and productions around the world, leading eventually to a new career as a theatre director. In 1956, he had his first commission from the BBC Third Programme for a radio play, All That Fall. He was to continue writing sporadically for radio, and ultimately for film and television as well. He also started to write in English again, though he continued to write in French until the end of his life. From the late 50s until his death, Beckett had a relationship with Barbara Bray, a widow who worked as a script editor for the BBC. James Knowlson wrote of them: "She was small and attractive, but, above all, keenly intelligent and well-read. Beckett seems to have been immediately attracted by her and she to him. Their encounter was highly significant for them both, for it represented the beginning of a relationship that was to last, in parallel with that with Suzanne, for the rest of his life". In October 1969, Beckett, on holiday in Tunis with Suzanne, learned he had won the Nobel Prize for Literature. Suzanne, who saw that her intensely private husband would be, from that moment forth, saddled with fame, called the award a "catastrophe." While Beckett did not devote much time to interviews, he would still sometimes personally meet the artists, scholars, and admirers who sought him out in the anonymous lobby of the Hotel PLM St. Jacques in Paris near his Montparnasse home. Suzanne died on 17 July 1989. Suffering from emphysema and possibly Parkinson's disease and confined to a nursing home, Beckett died on 22 December of the same year. The two were interred together in the Cimetière du Montparnasse in Paris, and share a simple granite gravestone which follows Beckett's directive that it be "any colour, so long as it's grey." Beckett's career as a writer can be roughly divided into three periods: his early works, up until the end of World War II in 1945; his middle period, stretching from 1945 until the early 1960s, during which period he wrote what are probably his best-known works; and his late period, from the early 1960s until Beckett's death in 1989, during which his works tended to become shorter and his style more minimalist. "It was morning and Belacqua was stuck in the first of the canti in the moon. He was so bogged that he could move neither backward nor forward. Blissful Beatrice was there, Dante also, and she explained the spots on the moon to him. She shewed him in the first place where he was at fault, then she put up her own explanation. She had it from God, therefore he could rely on its being accurate in every particular." The passage makes reference to Dante's Commedia, which can serve to confuse readers not familiar with that work. At the same time, however, there are portents of Beckett's later work: the physical inactivity of the character Belacqua; the character's immersion in his own head and thoughts; the somewhat irreverent comedy of the final sentence. Similar elements are present in Beckett's first published novel, Murphy (1938), which also to some extent explores the themes of insanity and chess, both of which would be recurrent elements in Beckett's later works. The novel's opening sentence also hints at the somewhat pessimistic undertones and black humour that animate many of Beckett's works: 'The sun shone, having no alternative, on the nothing new'. Watt, written while Beckett was in hiding in Roussillon during World War II, is similar in terms of themes, but less exuberant in its style. This novel also, at certain points, explores human movement as if it were a mathematical permutation, presaging Beckett's later preoccupation—in both his novels and dramatic works—with precise movement. It was also during this early period that Beckett first began to write creatively in the French language. In the late 1930s, he wrote a number of short poems in that language, and these poems' spareness—in contrast to the density of his English poems of roughly the same period, collected in Echo's Bones and Other Precipitates (1935)—seems to show that Beckett, albeit through the medium of another language, was in process of simplifying his style somewhat, a change also evidenced in Watt. After World War II, Beckett turned definitively to the French language as a vehicle. It was this, together with the aforementioned "revelation" experienced in his mother's room in Dublin—in which he realized that his art must be subjective and drawn wholly from his own inner world—that would result in the works for which Beckett is best remembered today. During the 15 years subsequent to the war, Beckett produced four major full-length stage plays: En attendant Godot (written 1948–1949; Waiting for Godot), Fin de partie (1955–1957; Endgame), Krapp's Last Tape (1958), and Happy Days (1960). These plays—which are often considered, rightly or wrongly, to have been instrumental in the so-called "Theatre of the Absurd"—deal in a very blackly humorous way with themes similar to those of the roughly contemporary existentialist thinkers, though Beckett himself cannot be pigeonholed as an existentialist. The term "Theatre of the Absurd" was coined by Martin Esslin in a book of the same name; Beckett and Godot were centerpieces of the book. Esslin claimed these plays were the fulfillment of Albert Camus's concept of "the absurd"; this is one reason Beckett is often falsely labeled as an existentialist (this is based on the assumption that Camus was an existentialist, though he in fact broke off from the existentialist movement and founded his own philosophy). Though many of the themes are similar, Beckett had little affinity for existentialism as a whole. Broadly speaking, the plays deal with the subject of despair and the will to survive in spite of that despair, in the face of an uncomprehending and, indeed, incomprehensible world. The words of Nell—one of the two characters in Endgame who are trapped in ashbins, from which they occasionally peek their heads to speak—can best summarize the themes of the plays of Beckett's middle period: "Nothing is funnier than unhappiness, I grant you that. ... Yes, yes, it's the most comical thing in the world. And we laugh, we laugh, with a will, in the beginning. But it's always the same thing. Yes, it's like the funny story we have heard too often, we still find it funny, but we don't laugh any more." Beckett's outstanding achievements in prose during the period were the three novels Molloy (1951), Malone meurt (1951; Malone Dies) and L'innommable (1953: The Unnamable). In these novels—sometimes referred to as a "trilogy", though this is against the author's own explicit wishes—the reader can trace the development of Beckett's mature style and themes, as the novels become more and more stripped down, barer and barer.Molloy, for instance, still retains many of the characteristics of a conventional novel—time, place, movement and plot—and is indeed, on one level, a detective novel. In Malone Dies, however, movement and plot are largely dispensed with, though there is still some indication of place and the passage of time; the "action" of the book takes the form of an interior monologue. Finally, in The Unnamable, all sense of place and time are done away with, and the essential theme seems to be the conflict between the voice's drive to continue speaking so as to continue existing and its almost equally strong urge to find silence and oblivion. It is tempting to see in this a reflection of Beckett's experience and understanding of what the war had done to the world. Despite the widely-held view that Beckett's work, as exemplified by the novels of this period, is essentially pessimistic, the will to live seems to win out in the end; witness, for instance, the famous final phrase of The Unnamable: 'I can't go on, I'll go on'. Subsequent to these three novels, Beckett struggled for many years to produce a sustained work of prose, a struggle evidenced by the brief "stories" later collected as Texts for Nothing. In the late 1950s, however, he managed to create one of his most radical prose works, Comment c'est (1961; How It Is). This work relates the adventures of an unnamed narrator crawling through the mud while dragging a sack of canned food, and was written as a sequence of unpunctuated paragraphs in a style approaching telegraphese: "You are there somewhere alive somewhere vast stretch of time then it's over you are there no more alive no more than again you are there again alive again it wasn't over an error you begin again all over more or less in the same place or in another as when another image above in the light you come to in hospital in the dark" Following this work, it would be almost another decade before Beckett produced a work of non-dramatic prose, and indeed How It Is is generally considered to mark the end of his middle period as a writer. Throughout the 1960s and into the 1970s, Beckett's works exhibited an increasing tendency—already evident in much of his work of the 1950s—towards compactness that has led to his work sometimes being described as minimalist. The extreme example of this, among his dramatic works, is the 1969 piece Breath, which lasts for only 35 seconds and has no characters (though it was likely intended to offer ironic comment on Oh! Calcutta!, the theatrical revue for which it served as an introductory piece). In the dramas of the late period, Beckett's characters—already few in number in the earlier plays—are whittled down to essential elements. The ironically titled 1962 Play, for instance, consists of three characters stuck to their necks in large funeral urns, while the 1963 television drama Eh Joe—written for the actor Jack MacGowran—is animated by a camera that steadily closes in to a tight focus upon the face of the title character, and the 1972 play Not I consists almost solely of, in Beckett's words, 'a moving mouth with the rest of the stage in darkness'. Many of these late plays, taking a cue from Krapp's Last Tape, were concerned to a great extent with memory, or more particularly, with the often forced recollection of haunting past events in a moment of stillness in the present. Moreover, as often as not these late plays dealt with the theme of the self confined and observed insofar as a voice either comes from outside into the protagonist's head, as in Eh Joe, or else the protagonist is silently commented upon by another character, as in Not I. Such themes also led to Beckett's most politically charged play, 1982's Catastrophe, dedicated to Václav Havel, which dealt relatively explicitly with the idea of dictatorship. After a long period of inactivity, Beckett's poetry experienced a revival during this period in the ultra-terse French poems of mirlitonnades, some as short as six words long. These defied Beckett's usual scrupulous concern to translate his work from its original into the other of his two languages; several writers, including Derek Mahon, have attempted translations, but no complete version of the sequence has been published in English. Beckett's prose pieces during the late period were not so prolific as his writing of drama, as suggested by the title of the 1976 collection of short prose texts Fizzles, (illustrated by American artist Jasper Johns). He did, however, experience something of a renaissance, beginning with the 1979 novella Company, and continuing on through 1982's Ill Seen Ill Said and 1984's Worstward Ho, later collected in Nohow On. In the prose medium of these three '"closed space" stories', Beckett continued his preoccupation with memory and its effect on the confined and observed self, as well as with the positioning of bodies in space, as the opening phrases of Company make clear: "A voice comes to one in the dark. Imagine." "To one on his back in the dark. This he can tell by the pressure on his hind parts and by how the dark changes when he shuts his eyes and again when he opens them again. Only a small part of what is said can be verified. As for example when he hears, You are on your back in the dark. Then he must acknowledge the truth of what is said." In the hospital and nursing home where he spent his final days, Beckett wrote his final work, the 1988 poem "What is the Word" ("Comment dire"). The poem grapples with an inability to find words to express oneself, a theme echoing Beckett's earlier work, perhaps amplified by his sickness late in life. Billie Whitelaw worked with Beckett for 25 years on such plays as Not I, Eh Joe, Krapp's Last Tape, and Footfalls. She first met Beckett in 1963. In her autobiography she describes their first meeting in 1963 was "trust at first sight". Beckett went on to write many of his experimental theatre works for her to play. She came to be regarded as his muse, the "supreme interpreter of his work", perhaps most famously known for her role as W in Rockaby. She said of the play "I put the tape in my head. And I sort of look in a particular way, but not at the audience. Sometimes as a director Beckett comes out with absolute gems and I use them a lot in other areas. We were doing Happy Days and I just did not know where in the theatre to look during this particular section. And I asked, and he thought for a bit and then said, 'Inward' ". She says of her role in Footfalls "I felt like a moving, musical Edvard Munch painting and, in fact, when Beckett was directing Footfalls he was not only using me to play the notes but I almost felt that he did have the paintbrush out and was painting." She stated "Sam knew that I would turn myself inside out to give him what he wanted... With all of Sam's work, the scream was there, my task was to try to get it out." She stopped performing his plays in 1989 when he died. Of all the English-language modernists, Beckett's work represents the most sustained attack on the realist tradition. He opened up the possibility of drama and fiction that dispense with conventional plot and the unities of place and time in order to focus on essential components of the human condition. Writers like Václav Havel, John Banville, Aidan Higgins and Harold Pinter have publicly stated their indebtedness to Beckett's example. He has had a wider influence on experimental writing since the 1950s, from the Beat generation to the happenings of the 1960s and after. [dead link] In an Irish context, he has exerted great influence on poets such as John Banville, Derek Mahon, Thomas Kinsella, as well as writers like Trevor Joyce and Catherine Walsh who proclaim their adherence to the modernist tradition as an alternative to the dominant realist mainstream. Many major 20th-century composers, including Luciano Berio, György Kurtág, Morton Feldman, Pascal Dusapin, Scott Fields, Philip Glass, Roman Haubenstock-Ramati and Heinz Holliger have created musical works based on his texts. Beckett's work was also an influence on many visual artists, including Bruce Nauman, Douglas Gordon, Alexander Arotin, and Avigdor Arikha; Arikha, in addition to being inspired by Beckett's literary world, also drew a number of portraits of Beckett and illustrated several of his works. Beckett is one of the most widely discussed and highly prized of twentieth century authors, inspiring a critical industry to rival that which has sprung up around James Joyce. He has divided critical opinion. Some early philosophical critics, such as Sartre and Theodor Adorno, praised him, one for his revelation of absurdity, the other for his works' critical refusal of simplicities; others such as Georg Lukács condemn for 'decadent' lack of realism. American critic Harold Bloom pays attention to his atheism of Anglican source, compared with James Joyce's, former Catholic bent, noting "Beckett and Joyce shared the aversion to Christianity in Ireland. The two chose Paris and atheism." Since Beckett's death, all rights for performance of his plays are handled by the Beckett estate, currently managed by Edward Beckett, the author's nephew. The estate has a controversial reputation for maintaining firm control over how Beckett's plays are performed and does not grant licences to productions that do not strictly adhere to the writer's stage directions. Some of the best-known pictures of Beckett were taken by photographer John Minihan, who photographed him between 1980 and 1985 and developed such a good relationship with the writer that he became, in effect, his official photographer. Some consider one of these to be among the top three photographs of the 20th century. However, it was the theatre photographer John Haynes who took possibly the most widely reproduced image of Beckett: it is used on the cover of the Knowlson biography, for instance. This portrait was taken during rehearsals of the San Quentin Drama Workshop at the Royal Court Theatre in London, where Haynes photographed many productions of Beckett's work. On 10 December 2009, the newest bridge across the River Liffey in Dublin was opened and named the Samuel Beckett Bridge in his honour. 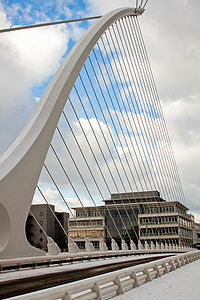 The bridge, depicting a harp on its side, was designed by the celebrated Spanish architect Santiago Calatrava, who had also designed the James Joyce Bridge further upstream opened on Bloomsday (16 June) 2003. Attendees at the official opening ceremony included Beckett’s niece Caroline Murphy, his nephew Edward Beckett, poet Seamus Heaney and Barry McGovern. A Bash In The Tunnel (Brighton: Clifton Books, 1970), essays on James Joyce by Beckett, Flann O’Brien & Patrick Kavanagh; John Ryan(editor). Collected Poems in English and French. New York: Grove Press, 1977. Endgame and Act Without Words. New York: Grove Press, 1958. How It Is. New York: Grove Press, 1964. More Pricks than Kicks. New York: Grove Press, 1972. Murphy. New York: Grove Press, 1957. Nohow On: Company, Ill Seen Ill Said, Worstward Ho. Ed. S.E. Gontarski. New York: Grove Press, 1996. Three Novels: Molloy, Malone Dies, The Unnamable. New York: Grove Press, 1995. Waiting for Godot: A Tragicomedy in Two Acts. New York: Grove Press, 1954. Badiou, Alain. (2003) On Beckett, transl. and ed. by Alberto Toscano and Nina Power. London: Clinamen Press. Bair, Deirdre. (1978) Samuel Beckett: A Biography. Vintage/Ebury ISBN 009980070-5. Caselli, Daniela. Beckett's Dantes: Intertextuality in the Fiction and Criticism. ISBN 0719071569. Fletcher, John. (2006) About Beckett. Faber and Faber, London ISBN 9780571230112. Gussow, Mel. "Samuel Beckett Is Dead at 83; His 'Godot' Changed Theater." The New York Times, 27 December 1989. Igoe, Vivien. (2000) A Literary Guide to Dublin. Methuen Publishing ISBN 0413691209. Mercier, Vivian. (1977) Beckett/Beckett. Oxford University Press ISBN 0192812696. O'Brien, Eoin. The Beckett Country. ISBN 0571146678. Ricks, Christopher. (1995) Beckett's Dying Words. Oxford University Press ISBN 0192824074. This page was last modified on 6 October 2010 at 18:05.